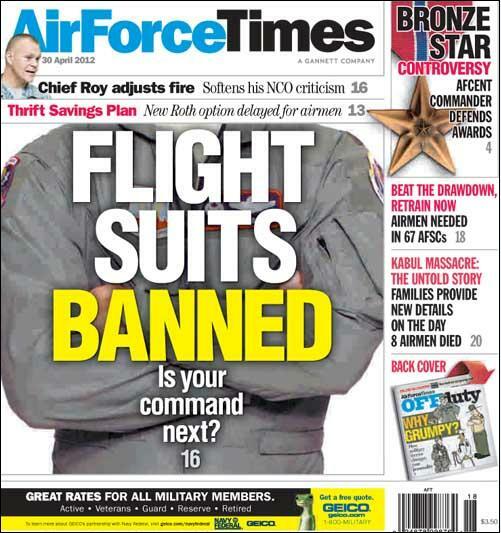 Most airmen at Air Force Space Command have been told they can no longer wear flight suits and leather “bomber” jackets. The move, which affects about 1,800 airmen, is meant to save Space Command about $670,000 a year and eliminate a caste system of “haves and have-nots,” Gen. William Shelton, head of the command, said in a statement. “There has always been a kind of envy of those who flew from those who didn’t regardless of what command,” said retired Gen. Lance Lord, who was in charge of Space Command from 2002 to 2006. Affected airmen have to start wearing camouflage Airman Battle Uniforms or their dress uniforms on Oct. 1. In other news, Chief Master Sergeant of the Air Force James Roy has sent an email to all airmen that is much softer in tone than one he sent a week prior about decorations and enlisted performance reviews. Instead of having hard and fast rules about how many airmen can get a 5 on their EPRs, “We need to have bold leaders to set high standards and help airmen achieve them,” Roy wrote. Roy was writing for a wider audience, not toning down his message or recanting any of his points, Roy’s spokesman Senior Master Sgt. Christopher Vadnais explained on Monday. And the Defense Finance and Accounting Service says airmen will have to wait until fall to use the Thrift Savings Plan’s new Roth option, while Defense Department civilians will get the option in early summer. The new investment option allows service members and civilians to invest after-tax earnings into funds that will grow without tax liability on future earnings. The thing that surprises me most is that one command spends $670,000 *every year* on flight suits. Can that possibly be the case? I don’t pretend to be an expert, so perhaps I misunderstand the situation. This is just another example of poor decision making by Air Force leadership. If they truly want to save money, they should take a serious look at their Wing structures in 14AF. Buckley AFB, for example, was stood up for the main purpose of supporting the SBIRS squadron. What transpired however, is the operational unit having to support the Wing due to poor manning structures from the start. This then created 14 other squadrons whose sole purpose is to support SBIRS. Before the Wing was stood up, SBIRS fell under the 21 SW, and the base was ran by the 140th Guard Unit and the mission was still strongly supported. Today is a different story…we now have infrastructure that must be maintained, looming utility costs, and a base that forgot what it was established in the first place to do: Support the SBIRS mission. Why would people in Space Command wear flight suits and A-2’s? It’s a flight uniform. I flew in the Army and couldn’t stand the flight suits. I’d change into BDU’s and jungle boots when not flying.